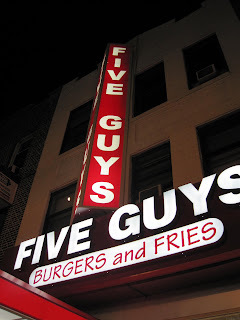 I first had Five Guys in the Baltimore area (I believe they're based there?) a few summers ago, and I thought their burgers were quite delicious. Even though they're well-cooked (company policy), they're still juicy. I also enjoy the various toppings they offer, especially mustard (I'm really not a ketchup-on-my-burger kind of gal) and jalapenos. 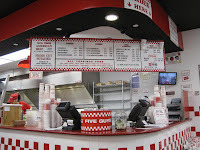 Five Guys also has free peanuts while you wait, but I'm not crazy about peanuts either. Peanut butter? Oh yes. Actual peanuts? Eh. 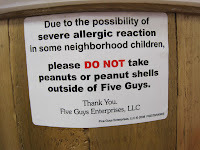 They post a sign asking for consideration in light of the many allergic folks in the area--the one in Baltimore practically roped off the area as a 'No Peanut Zone.' 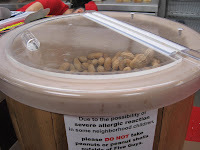 I've always appreciated that this particular store is always neat and clean---the customers are also good about not scattering their peanut shells everywhere. 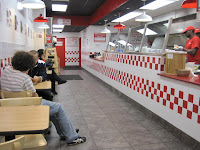 Five Guys came to Bay Ridge about a year or so ago, and I've stopped in a few times. My standard burger is the Little Cheeseburger (unless you're a linebacker and/or starving, the regular burger--2 patties--is just too damn much) with mustard, pickles, lettuce, raw onions, and jalapenos. 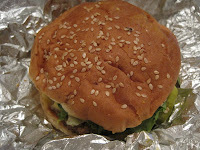 Let me tell you: this was a darn good burger. 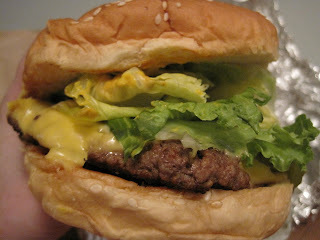 Even though it's well-cooked (I prefer my burgers cooked medium), it still has great flavor, and isn't dry at all. 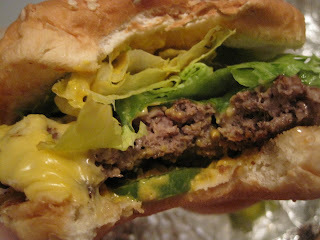 The tangy, salty toppings were crisp and delicious: the jalapenos were almost blindingly green, and they added a wonderful, sharp heat to the burger. 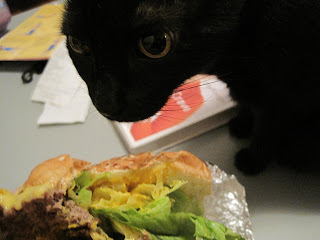 The burger smelled so good it even got the attention of one Mitzi May, my stray-turned-pampered feline who normally ignores all people food (except lettuce). 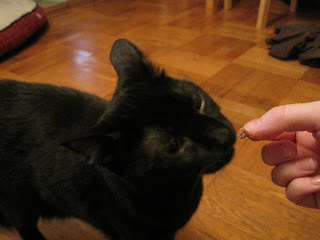 This time, however, she wasn't interested in the greens--she wanted the meat! Little brother Oliver was not about to miss out on the party, either. He came up for a sample, and they were both just so darn cute and polite about it (not grabbing or begging, just looking up at me with those big old eyes) that I couldn't resist. They each got a teeny tiny bite (after I finished my meal, of course).